The reason for Google Drive’s popularity is evident – you can upload, edit and store your files online, without taking up the precious space at home or in the office. Besides that, it enables you to access and synchronize your files from multiple devices, therefore being a service of choice for many accountants, teachers, students and managers. Being a dependable tool, Google Drive is often a place to safely store a wide array of document types, including PDF files, which are, unfortunately, not editable by default. The Drive does provide a solution to that problem: it allows you to convert PDFs to fully editable Google Docs format. This is a viable solution for any PDF file that has a lot of text, but what happens when you have to edit an Excel SpreadSheet generated PDF file? 1) Find your PDF file and right click on it. Select Open With > Cometdocs PDF Converter. 2) When prompted to select the conversion type, choose “to Excel (xlsx)”. You will be presented with the converted file. 3) Click on “Open With” and choose “Google Sheets”. And there you go! 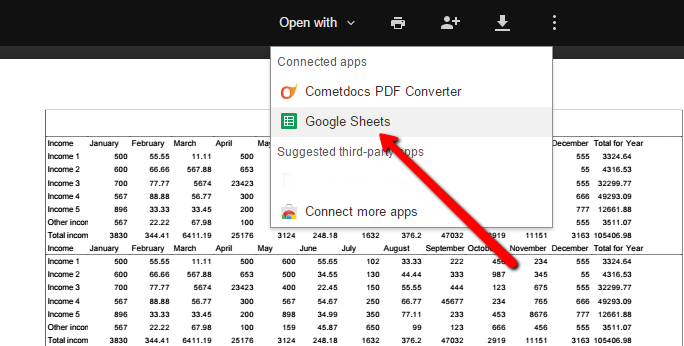 You have successfully converted PDF into a Google Sheets document which you can now freely edit.